This week on Elite Advisor Blueprint, Ian Cron is here to talk about the Enneagram, an ancient personality typing system with an uncanny accuracy in describing how human beings are wired, both positively and negatively. Ian is a bestselling author, Enneagram teacher, nationally recognized speaker, psychotherapist, and Episcopal priest. His books include Chasing Francis, Jesus, My Father, the CIA, and Me and most recently, The Road Back to You: An Enneagram Journey to Self-Discovery. Ian draws on an array of disciplines—from psychology to the arts, Christian spirituality to theology—to help people enter more deeply into conversation with God and the mystery of their own lives. He and his wife, Anne, live in Nashville, Tennessee. In today’s conversation, Ian wastes no time getting to the heart of the content and shares each of the 9 Enneagram personality types, exploring why people think, feel and act the way they do and how we can apply this information to the world of financial advising. Ian shares a conversation he had with a friend who happens to run a hedge fund and how knowing a difficult clients Enneagram number, helped him better know how to communicate in their meetings. This eventually led to this client moving more of their assets to him. 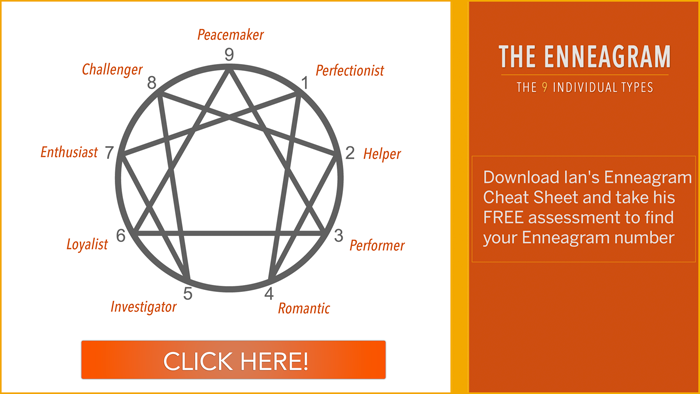 We cover the 9 Enneagram personality types and how they can help us recognize patterns of behavior in our prospects, clients, teams, spouses, or anyone else we may encounter. We get to why self-awareness may be the single most important factor to your success. How financial advisors can use the Enneagram to better interact face-to-face with clients. How to avoid the workaholic trap as a high achieving financial advisor. Ian’s deep understanding for how to further discover yourself and connect with people is undeniable and invaluable. I can’t wait for you to check out this interview and apply the insights that he shares to your own journey as a financial advisor! [04:30] Find out what the Enneagram is and how it can help you better understand the differing personalities of people. [07:49] Ian shares a story of how the enneagram helped a highly experienced hedge fund manager (who oversaw 25 billion in assets) win the respect of one of his most confrontational clients, resulting in even more business! [12:30] Discover the 9 interconnected personality types, what they mean and how you can use them to your advantage to build a better team. [26:50] Find out how Bill Clinton leveraged the power of being a 9 personality type (Peacemaker), to display empathy, reconcile relationships and forge some of the most difficult deals in the world. [29:00] How financial advisors can apply the Enneagram methodology to create better face-to-face interactions with their clients. [31:31] The three fundamental emotions that everyone tries to manage. [32:39] Why we’re all looking at the same screen, but watching a different movie. [35:00] Discover the space between stimulus and response and how it can affect your growth and freedom. [38:15] Find out why self-awareness is absolutely critical in the world of business. [38:54] How independent financial advisors (3’s, 7’s & 8’s) can overcome workaholic tendencies. [46:39] The first person Ian thinks of when he hears the word “successful” – HINT: I was surprised by his response! [47:46] Ian shares some of his favorite books. [49:28] Why every young man or woman needs to find a mentor. [50:55] Why being an 8 personality type as a woman in business can be extremely difficult. [52:43] The one piece of advice that has led to Ian’s success. [00:00:38] Brad: Thanks for joining. My name is Brad Johnson and I’m the VP of Advisor Development and Advisors Excel. In each episode of The Elite Advisor Blueprint podcast, it’s my goal to distill the best ideas and advice from top thought leaders and apply it to the world of independent financial advice. In this episode, I talk with Ian Cron. He’s a bestselling author, nationally recognized speaker, and my guess is you haven’t read across this one before, he’s both a psychotherapist and an episcopal priest. Get ready for some serious psychology and how to get into your prospect’s heads as we dig into Ian’s most recent book, The Road Back to You and into an ancient personality typing system with an uncanny accuracy in describing how human beings are wired both positively and negatively. It’s called the Enneagram and it’s scary how accurate it is. I’m guessing like me prior to a few months ago, you’ve never heard of it before. However its origins date back hundreds of years and for those of you who’ve ever taken a Kolbe, a DISC profile, StrengthsFinder, Myer-Briggs or dozens of other personality profiles I’ve seen in our industry, especially if you happen to use them in your hiring process as many of our clients do, this may be your favorite show to date. In fact, Ian set up the ability to do a free assessment for all of our listeners and your staff if you’d like. So now might be a good time to hit the pause button and go out and download Ian’s free tool which breaks down all nine personality types from the Enneagram and also offers the link for the free assessment to see what your number is. It took me about five minutes to take it and figure out my number. It’s available at bradleyjohnson.com/18. Also for many of you listening on mobile, most include show notes now, simply swipe to them and it will be linked at the top of the notes for your convenience. Okay, so hopefully you’re coming back from grabbing your free assessment from Ian and have a decent idea what your number is as this conversation’s gonna dig deep on key motivations for each number and how to best communicate and interact with them. Obviously very important stuff when you’re sitting across from prospects or when you’re leading a team. Here’s a quick overview of what we covered on this conversation. Very early on, Ian shares a conversation he had with a friend who just so happens to run a hedge fund and how knowing a difficult client’s Enneagram number helped him better know how to communicate in their meetings. It actually eventually lead to this client moving more of their assets over to him. If you only have time to listen for just a few minutes, it’s right at the start and definitely a story worth listening to. From there, we cover the nine Enneagram personality types and how they can help us recognize patterns of behavior in our prospects, clients, teams, spouses, or anyone else we may encounter. Later on, we get to why self-awareness may be the single most important factor to your success, and how financial advisors can use the Enneagram to better interact face to face with clients. And we wrap with how to avoid the workaholic trap as a high-achieving financial advisor. You guys are gonna love this conversation with Ian so I’m gonna get to the interview. One last reminder, if you haven’t already taken a few minutes to download the Enneagram cheat sheet Ian shared, it’s available free and you can also take his assessment to figure out your Enneagram number. It will get you a little bit better context of this chat and it’s available at bradleyjohnson.com/18 or in most of your mobile podcast players you can swipe to the show notes and simply click the link at the top of the post. As always, you can find everything including links to books mentioned, people discussed, a full transcription of the show, and everything else in our show notes as well. Thanks for listening and without further delay, my conversation with Ian Cron. [00:04:56] Brad Johnson: Welcome to another episode of the Elite Advisor Blueprint. I’m excited to have my buddy, Ian Cron on here joining us today. Welcome, Ian. [00:05:09] Ian Cron: Thank you. Glad to be here. [00:05:11] Brad: So it was really cool how we got the chance. I wish I could meet all of my friends this way. The first time we ever met was at a Blackberry Farm on the foothills of the Smoky Mountains. Our mutual friend, Michael Hyatt set up a little marriage retreat. My wife and I were out there end of 2016 and then you were the guest of honor. You walked us through a couple of days of the Enneagram, digging in there, The Road Back to You, your most recent bestselling book. I just thought we’d start out, just because obviously we’re doing a podcast here for financial advisors. Can you speak through the Enneagram and what that is and explain it for a lot of novices because I honestly had no clue what it was until we had a chance to meet. [00:06:06] Ian: Well, the Enneagram is a personality typology not dissimilar, I suppose, in terms of metrics to the Myers-Briggs or the DISC or the Strength Finders, instruments that people are familiar with in the business world. In my opinion, what makes it particularly useful and interesting is the Enneagram helps teams of people understand who they are at their best and who they are when under stress and when they’re feeling great. Lots of other metrics basically view the human personality as being somewhat static. The Enneagram takes into account that it’s fluid. It’s situational, it’s adaptive. And so when it comes to trying to, in this world that’s increasingly globalized, you really have to learn how to collaborate in new ways now. And so understanding people’s personalities help you eliminate drag coefficients. Wonderful that way. [00:06:58] Brad: I just wish after spending a couple of days at the retreat and it was about a day and a half of you leading a live experience for us where you’re walking our small group through what really each of the numbers meant, how they interacted with each other, as you said, how fluidly you can kind of move from one to the next. I learned more about my wife that I’ve been married to over 10 years now and in two days I felt like… I wish we would have had this at the front end but can you share a little bit on the background where the Enneagram originated from? And I completely agree with you. I’ve taken the Kolbe, I’ve taken StrengthsFinder, I’ve taken DISC, I’ve never seen a test or a framework that really sums up I guess how people interact with each other like the Enneagram does. So can you share a little bit more background where it came from and how it came to be? [00:07:59] Ian: I do agree with you. It’s uncannily accurate. The first time I encountered it, I was in Grad school doing my counseling degree to become a psychotherapist and I have to say, I remember reading and going, “Gosh I spent several years studying the human personality and this basically is more useful tool than anything I’ve learned in the classroom.” The Enneagram’s origins are somewhat unknown; it’s actually quite old. It was an oral tradition until the 1970’s when people first began to publish it. And what’s happened over time, it’s true with all our traditions, it’s been influenced by lots of other disciplines. In the case of the Enneagram, obviously modern psychology has really developed the framework into something that’s very useful for organizations, churches, families, marriages. It has tremendous application across a wide array of situations that people find themselves in. [00:08:56] Brad: Let’s take this through the lens of financial advisors, the vast majority of my listenership here. Let’s just go to that story you shared with me right before we started recording here, I love. And maybe this is a good lead into a quick overview of each of the numbers and how they have individual characteristics. You were sharing that you’re having a conversation with a hedge fund manager that oversaw a 25 billion or so of assets, so doing pretty well for himself. Can you just share the conversation how the Enneagram kind of came into play there? [00:09:26] Ian: Well interestingly, this is the guy who graduated from Yale then went to Harvard Business School. So this is a guy who had a lot of experience in business and worked at Goldman Sachs for many years and then launched out on his own. He came through one day and he said, “I have a client that’s really thorny and I just need to get some advice on him because he represents a big chunk of our business. And I wanna get more.” So I’m having a meeting with him and he is very combative, he’s aggressive, he’s confrontational and he’s just a terrifically powerful presence and personality. This guy was sort of a patent-type. Lead me, follow me or get out of the way. He said, “What do I do?” So I say, “tell me what you’re approach has been with this guy before.” He said, “I’m very diplomatic. He has tons of questions and he gets right up in my face. I’m very diplomatic with him. I’ve tried to calm him down.” And I said, “Well based on what you told me, I’m gonna bet this guy’s is an eight on the Enneagram.” There are nine basic core personality types in the Enneagram. I think he’s an eight, which is called the challenger. Challengers are blunt to a fault. They don’t tend to trust people until they‘ve proven they’re trustworthy. The way that they will try to get to a place where they trust you is they’re gonna confront you a lot. They’re gonna keep testing you, and testing you and testing you. Because eights believe that they can get into a fight a little bit with you; verbal skirmish that if you have a hidden agenda it will come out, that you’ll show your cards. They also won’t respect you unless they know that you can stand your ground with them. So I said, “When you go on those meetings, obviously keeping in mind, you wanna be respectful. And when this guy powers up on you, you need to meet him with every bit as much power as he throws in you. If you do, he’ll relax. He’ll realize, “Okay, I got another big dog on the porch, I’m not the only big dog here. I’m not the only big dog anymore.” And then he’ll be ready to do business with you. Sure enough, that’s what happened. [00:11:25] Brad: What’s interesting about that in our small group out at Blackberry, the two eights I remember in the group were both CEOs, that hard charger, leader type of personality. It’s funny because you were saying that they were nodding their heads and I remember in the group that’s kind of their personality type. [00:11:43] Ian: Usually their wives are elbowing them from the sides too while this is all going on. Eights and threes tend to be very aligned with the American stereotype or the American image of what a great leader or CEO is in the company. Jack Welch, for example is an eight and his nickname was Neutron Jack. Can you imagine? But he also brought GE’s bottom line up to its all-time high, I think at that time. So it was effective but he wasn’t necessarily a great relationship builder either. You’re healthy in your number, every number is great. That you’re unhealthy not self-aware, you could go through your work world banging guard after guard rail being very self-defeating on your behaviors. [00:12:33] Brad: So obviously I got a little more experience here than, I would guess the vast majority of listeners. One thing we’re gonna make sure we put on the show notes is, I believe on your website iancron.com you have an assessment. Very quick, I think 40 or maybe 50 questions where very quickly you can get your number, what your number is. [00:12:53] Ian: Well you get into the neighborhood, like any self-report assessment, Myers-Briggs, Kolbe and anything else like that, it all depends a little bit on the self-awareness of the person taking it. I strongly recommend that people who have an interest in the Enneagram actually read about it. But the assessment is a good vestibule into the house. [00:13:12] Brad: So we’ll put that in the show notes and I have read your book, The Road Back to You, I’ve read it on the flight out to Blackberry. I highly suggest that those that take the assessment dig in because the book will expand on what those numbers actually mean. For the listeners here, whatever order makes sense; just kind of go around the wheel and give us a real quick overview of what each of those numbers look like? [00:13:37] Ian: Let’s do this. Let’s start with two, three, and four and then we’ll work our way around because there are triads inside the Enneagram that might be helpful to people. Two, three’s and four’s are all in what’s called the Feeling of Heart triad. These people have the most image conscious numbers on the Enneagram. Twos are called the Helpers, they have a need to be needed. These are the people who are the most interpersonal of all people; warm, compassionate, supportive. They are always available to be of service to other people. When they’re healthy, they’re altruistic in their giving. When they’re unhealthy, there’s always a string attached. And the string is, I’ll help you if we kind of make this quid pro quo arrangement that you’ll help me when I need it without my even needing to ask. Threes are called the Performer or the Achiever and I bet you have a lot of these folks in your audience right now. These are folks who are high-achieving people often times found in upper management corporations. They’re great in sales, tremendous sales people. The Achiever has a real need to succeed. They tend to believe that people are valued for what they do more than for who they are inside. And that can really drive or motivate their behavior in some really significant ways. For example, threes will often adapt an image in order to suit or fit the crowd. Now, that come in really handy when you’re doing sales but eventually you can get lost in your own performance and lose any sight of who you actually are as a human being. You actually begin to believe you are the image that you are projecting at any given moment. Threes are people who are fixated on accomplishing goals; they like specific goals, very clear goals and they like to get them completed in as quick and efficient a manner as is possible. Unfortunately, if they’re unhealthy and not very self-aware, what they’ll do is they’ll cut corners or take shortcuts in order to accomplish those goals which can really sacrifice the quality of their work. But whenever they’re healthy, they’re really focused, not on just their own success and flaunting their own success, which they can do when they’re not in a good space, they focus on other people becoming successes. When that happens, they’re inspiring leaders who bring out the best in other people in their teams. Fours, I doubt you have very many of these. Fours tend to gravitate toward the arts and they’re highly creative people. They have a need to be unique and kind of special, to stand out; they love to be perceived as being unique. Fours are sometimes called the Tragic Romantics, they believe that they need to be really special in order to compensate for what they perceive to be a hidden flaw or something that they’re missing that other people have which they really would like to get but they don’t even really know how to name it. But out of that can pour some amazing literature, music and art. Without Fours in the world you wouldn’t have people like Meryl Streep or Ingmar Bergman or some of these great artists that we spend a lot of our time listening to or watching. So those are the three in the Heart triad, they’re very based around their feelings, take the world into their feelings. Five, six, and sevens are in the Head or the Thinking triad. Fives are called the Investigators. Think about people like for example, Bill Gates would probably a five leader. Fives love to understand; they really need to understand and know things. They are hoarders of information and knowledge. Fives are the people that could spend a whole day reading a book or trolling the internet. They fall down the wormhole of the internet and spend days researching topics for hours upon hours. They’re usually very, very smart in a particular niche area of their own. [00:17:23] Brad: I’ve got to jump in here because I’m gonna assume an engineer mindset would fit to a Five. [00:017:28] Ian: Yes. Highly analytical and very private, awkward in social situations, need a lot of solitude and too much social interaction with other people just really drains them. [00:17:42] Brad: So let’s dig in here because it’s kind of like an inside joke in financial services where it’s like, I got the engineer that came in and he pulled out his seven page long printout of a spreadsheet, he’d analyze every single product in our industry and he wanted to know contract line number 42. So you gave the example earlier how you would meet an eight in an appointment. We wanna help everyone, how would you deal with somebody that’s a five that really wants to dig deep on all the information if you were dealing with them face to face? [00:18:18] Ian: Again, what determines your type is not traits or characteristics, it’s the underlying motivation that drives it. In my experience for example it’s true that engineers, highly analytically-minded people often are fives. But the person you just described could easily be a one, the perfectionist. It could be a six who’s a risk-management person who’s always imagining worst case scenarios and so they wanna know everything so in the event that something wrong happens they’ll know what to do. But if they were a five, in the perfect setting, it would be the guy who’s designing the software that’s from the black box, that’s making your investments, if you’re doing that kind of trading for example. Coders would most likely be five, they’re introverts. They would like to put as many buffers between you and them as possible so that they don’t drain all their energy on social interactions. Now if you’re gonna approach a five. I think be careful with five is they’re very private and they don’t like intrusive questions. They really kind of feel the whole world is a little intrusive. And they are very minimalistic in their lifestyles; they require or they feel independent and self-sufficient, self-contained. Don’t be offended when a five leaves your office party early; it’s not personal, it’s just that the external stimulus, the noise, the crowd, the whole thing is overwhelming to them. And they just are losing their inner resources to maintain connection with other people. In most settings they’d rather just disappear or just be invisible. Let’s move on to sixes though. Sixes are called the Loyalist. They’re wonderful human beings, but as the truth all these numbers in this triad, five, six, seven, these are fear-based people. We think that there are more Sixes in the world than any other type, that’s speculative. But based on what know from conferences and others, data and research, we think that’s the case. Sixes are worst case scenario planners. They’re the devil’s advocate in all your meetings. Let’s say you put up a plan, and do you know what your number is, by the way? [00:20:25] Brad: I’m a seven. My wife is a six. [00:20:30] Ian: Well that’s a good balance. [00:20:33] Brad: I think I know where you’re going here. [00:20:34] Ian: It’s a good balance but this happens in business or in marriage. So the seven comes rolling in the door with all these optimism and all these plans and a whiteboard is heaven to a seven. Give him a marker and a whiteboard, they just can’t stop and they just believe everything is possible. Everything. And the six is the eternal pessimist when they’re unhealthy particularly. They are worst case scenario planners. They always are imagining and planning for the worst possible disaster. They’re scanning the horizon, they tend to catastrophize. They really wrestle with decision-making, they don’t trust their own inner compass when they’re not doing well. So they will go out and when faced with a decision and just ask advice from everybody. Do you think this is the right decision? They will ask the guy at the post office, they’ll ask their mother, they’ll ask everybody. But I’ll tell you, in a corporate setting especially if you’re an entrepreneurial mode or starting a new project, you don’t want to initially bring them in on the first couple of dream team meetings; but you definitely want them in the room around the third or fourth one. Because otherwise, guys like you will go charging forward without someone raising their hand and going, “This is a good idea but I don’t know if we have the cash reserves to make it happen.” And everyone in the room will go… “ahh” They’ll just deflate. But when you’re on the border of saying, “Okay, green light, let’s go.” You do need someone in the room who’s gonna ask hard questions about the viability what it is that you’re about to do. So they have great value. And that’s true for every number. Can you see how important it would be? I think of the time it saves and the interpersonal friction that you can avoid if you know this to be true about people. It’s just so helpful. [00:22:18] Brad: It was amazing just two days and now we’re going back to the indecision. My wife’s a 6 and it would really annoy me at times but now I know the reasoning behind why these questions are happening. [00:22:32] Ian: It’s not because she doesn’t trust you; that’s not the case. She just in many ways wants you to know that you have the big picture in mind and what she’s supposed to do should something go wrong. [00:22:53] Ian: Yeah right because sevens are called the Enthusiasts. My sons are sevens, I love them when they’re healthy and in a good space they’re dynamite, they’re deep, wonderful. I would say about my son that every day is a snow day even in the summer. Every day, he just gets up just believing the best is around the corner. Sixes manage fear with pessimism. Sevens manage their fear with optimism. It’s sort of a compensatory attitude toward life, toward dealing with their own anxiety. Sevens have a need to avoid uncomfortable or unpleasant emotions. Boredom, stuck or routine are the death of a Seven. So if you got a Seven working for you, the last thing you wanna do is put them in a management position most of the time unless they’re very healthy. Or unless they have a great chief of minister or officer around or someone else that people could report to because they’re dreamers and they’re great at the startup end of the project. Sevens are great at reframing so for example if something goes wrong, a Seven, rather than dealing with guilt or shame or blame, or any other uncomfortable emotion in the moment, will reframe it as a positive, in a heartbeat. This is a silly example, I suppose. But let’s say, think about a bad deal and suddenly they just lost 5 million dollars. The moment they say it, the moment they admit it, first of words out of their mouth will be, “But I learned a lot. Isn’t that great? This is gonna be great for the firm because it’s gonna get us back to the days when we were really struggling. Remember those days?” And suddenly you’re like, “How did you just make that into a good thing?” But again,you’re dynamite around because they bring so much energy to teams and so much positive spirit. I just did a corporate consultation, maybe a year ago for a company that had a Seven in Senior Management. And he is a real problem. Because he’d been in the job too long and it had become routine to him and he was just ready for the next adventure. Sevens are always ready for the next adventure. They’re always thinking of the future, always planning the new escapade, the new exciting thing that’s coming up and there was nothing on his radar that indicated there was anything like that in the future. So it just really helped to move him where their company go, “Okay, we need to move this person into a new position overseeing a brand new launch of a new product.” And suddenly the guy lit up like a light bulb. So that’s that fear triad. Do you have questions about those? [00:25:50] Brad: Yeah quick question. I think I remember this from our retreat. Mostly, did you say sales would be a lot of threes and a lot of sevens or am I making that up? [00:25:31] Ian: Threes, sevens and eights are great in sales. They’re all aggressive numbers. Aggressive not necessarily the negative sense. It just means they move out towards people very easily. They walk in a room with a lot of confidence. Threes in particular, they know how to play the part. A three can walk into a bar and sell life insurance, roll up his sleeves, sit at the bar and start cussing and watching the television and talking football until the guy behind the bar thinks, “This guy’s one of us” and buys insurance. They’ll go down the street to a church and then he’ll put his tie on and roll his sleeves back down and walk up to the secretary and she’ll say, “oh can I help you?” and “Yeah. I’d like to see the pasture” “Oh good, how are you?” and he’ll say, “Blessed.” And suddenly, he’s just super spiritual. [00:26:17] Ian: Yeah she read the book Emotional EQ, you know that Goleman referred to those people when they’re unhealthy as social chameleons. But sevens and eights, man they’ll walk into a room and they own it too, for different reasons. [00:26:36] Ian: I’ve already talked about eights a little bit. They’re the Challengers. We could probably skip past this; I’ve already spoken about them. Nines are called the Peacemakers. Peacemakers have the need to avoid conflict at all costs. You don’t find a lot of peacemakers at the high end of corporations. Usually they aspire to not go much higher than middle management and the reason is they don’t want a lot of the conflict that’s inevitable if you’re running a company or a firm. You’ve got to fire people, you’ve got to sit down and do 360s that may involve lot of criticism in them or disagreement. And nines avoid that at all costs. But what nines bring to the table is they are remarkable peacemakers so they can reconcile things or people or issues to everybody else appear irreconcilable. People sometimes thought Bill Clinton was a three and I’m pretty he was a nine; which goes to show you that nines can be in positions of great authority if they’re healthy. But what made his nineness apparent to me was his ability to forge deals not just across difficult lines but Northern Ireland, Bosnia. Maybe if we he could have time he could have taken on Palestine and Israel. He just knew how to sit at a table and see the world through and everybody’s point of view through their eyes, to the point, by the way that everyone at the table. Someone once said, Clinton would get five people at the table and he was so good at seeing their point of view on a particular issue that not only did people feel like he empathized and saw their point of view, that he actually agreed with them. He was so good at it then so that when he finally made a decision among those five people and the other four people that didn’t win, their point of view wasn’t taken, they felt betrayed. As if he lied to them. He’s like, “I didn’t lie, I just was able to see everything from your point of view. I understood your argument.” Once you call the perfectionist, if you want your airline pilot to be a perfectionist, you want your pharmacist to be, sometimes they’re called reformers, it’s probably a better word in some ways because they’re always trying to improve or reform the world. They are the people that when they walk in a room, the first thing they see is what’s wrong or what’s out of order. First thing they see is the mistake. They don’t mind telling you that you’ve made a mistake and how you can correct it which doesn’t always make them very popular when they’re not self-aware. You want one to be your tax accountant; you want them to be the person who’s your contract lawyer that does not miss a word. They are meticulous detail oriented people. When they run into trouble, is when they think their way is the right way and there is no other way sometimes and so they can be inflexible and rigid. And people experience them as judgmental and overly critical at times. [00:29:10] Brad: I can think of the one in our group was an attorney so spot on there. [00:29:16] Ian: Whatever you do, don’t be late. [00:29:19] Brad: Just kind of taking that overview that you’ve now given us on the Enneagram could you apply it to a couple areas? Let’s go with, most of our listeners, once again are advisors, every single week, their day to day is face to face interactions. Often times, one to one or the advisor to husband, wife. Let’s say they just got out, they do the quick assessment, they figure out what their number is. Let’s say they pick up the book or just listening the last few minutes here, they’ve got a good overview of the different numbers and high kind level of how they work. How could they apply that to better interacting face to face with clients just knowing that? [00:30:00] Ian: First of all, just in a general sense, we tend to assume that everybody sees the world the way that we do, that they process information the same way that we do, that they are interacting with the world the same way we are. And they are not. But there are at least nine different ways of seeing the world. And inside of each of these personality styles, there’s an infinite variety of sort of expressions of the same personality style. So you first walk into a meeting assuming that whoever you’re meeting with, there’s a high probability they do not see the world the way that you do. Absolutely not. I mean, can you see how different it would be at a meeting with a one versus a seven? Those are two very different people and if you wanna serve them, they would behoove you to try and identify the way that they see the world, Enneagram can give you some clues as to how you might be able to do that. I would also say that financial advisors that they meet one on one with people is to understand that some of those different personality styles take a while to make decisions. They’re not instant decision-makers. Do a lot of listening. Now I know this is just basic sales 101 right? It’s much better to spend a lot of time listening to people than it is selling people. People tend to oversell from out of the gate, tend to either arouse suspicion or to make some of those withdrawing types back away from the table a little bit. Everybody, there’s not a sole on the Enneagram or in the world that doesn’t want you to listen to their concerns and anxieties, not one. Or what their needs are. Nobody will ever accuse you of listening too much and taking notes. And just know, there are basically three fundamental emotions that all of us try to manage all the time, fear, anger and/or shame, feelings. Everybody’s trying to cope with all three of those dynamics going on at the same time with all different management systems for them. So I can’t recommend highly enough to people in sales to know these different personality styles and their expressions and once you do, you really are advantaged. We’re not just trying to make a sale, we’re trying to improve the quality of people’s lives. Everything that a financial advisor does has so many effects and so many areas of individuals’ lives, in their marriage, for their children, their livelihoods. It’s a great responsibility and the burden is on you really as an advisor to serve your customers well, to know them well and to make decisions in mind of who they are. [00:32:54] Ian: I’ll let you know. [00:33:01] Ian: Okay, let me tell you who that is. [00:33:03] Brad: Okay, who is that? I was gonna credit it to you. [00:33:45] Brad: There you go, we found the origination. But it’s so true. I do it, dealing with advisors. It’s funny as you were saying the eternal optimist; I could see how that could wear in people, because sometimes there are negative things that come out and you have to acknowledge them and be real about them. [00:34:03] Ian: As I said, the Enneagram takes into account that these personality styles are dynamic. So you can be anywhere within your number at a range from healthy to unhealthy. When you’re healthy, every single one of these numbers is awesome, when they’re healthy. Every single one is great and needed inside of an organization or on different roles. When you’re unhealthy, you’re a mess if you’re at the lower average to unhealthy range. And you’re all the time, moving up and down in there in the a course of a day. You get a ten o’clock call and be real healthy all of a sudden and then get up in a meeting at three in the afternoon and find yourself in the really unhealthy range. So you can know what you look like and when you’re not very healthy, you can spot it in real time. You begin to make adjustments to your behaviors and your way of being with other people. That’s the joy of it. It gives you freedom to make different choices you didn’t have when you were running on automatic. [00:35:00] Brad: I wanted to make sure we talked about this quote because you shared a quote that I can literally say changed my life and my perspective. My wife and I have talked about it multiple times since we left and it was this one, “Between stimulus and response there’s a space. In that space is our power to choose our response. And in our response lies our growth and our freedom.” And digging in on that, just going back to healthy and unhealthy, a lot of difference for healthy and unhealthy from my experience is how big of a space you have between that stimulus and response. If you actually give yourself some time to think about it, usually you can start to lean towards the healthy side of that but do you wanna dig in on that? I just think that that’s a quote to live by. [00:35:57] Ian: Yeah sure. It’s a tremendous quote. It’s Viktor Frankl, the holocaust survivor and psychologist, he’s a genius. If you don’t have self-awareness which is what the Enneagram gives you, affords you. You are constantly living in a state of reactivity. Always. You’re just reacting. You are just an autopilot inside the confines of your own personality, limitations of your personality. So what the Enneagram does hopefully is help you identify those aspects of your personality that no longer serve you the way that they did in childhood, that you need this to identify with so that you can live into your full potential. So when you’re in reactivity, the space between stimulus and response is very small, it’s like a crack in the sidewalk, you’re just stepping right over it, you don’t even know it exists, you’re just reacting as things come at you. But the more you grow on self-awareness, the larger that space becomes. The larger that space becomes, you’re able in that moment to take a pause. It doesn’t take long but you’re just able to say, “Okay, I can step back and observe myself right now. I can just step back and observe what’s going on and choose a different response than the one I used to choose all the time just reactively that never worked.” We just fall into these repeating, self-defeating patterns constantly but when we develop self-knowledge and the ability to, what I call push in the clutch. Just push in the clutch for a moment. Let the engine whine without engaging the transmission. And just observe and make a different choice than the one that you used to make that didn’t work. I was just reading an article, not long ago in the archives of the Harvard business review, that this is more and more in common the case in a world where we have to collaborate with other people. It’s not just my argument. It’s the premise of a lot of business consultants and that is that self-awareness may be the single most important thing you or your business can have. In the absence of self-awareness, you just cannot do your job well. You can’t collaborate well. You can’t do anything well. We’ve all worked with people who lack self-awareness and it’s never good. And the worst thing in the world is when you have a super talented person that you can’t afford to get rid of who has no self-awareness. That happens from time to time. And then you really require to bring in a coach to work with him help and help them to adapt an awareness of how they interact with other people and what’s not working. So that you can save them before they drown themselves in their own mess. So self-awareness, absolutely critical in the world of business. [00:38:25] Brad: I wanna segue a little bit, I see this a lot and we’re fortunate at our company… We’re working with about the top five percent of independent financial advisors, if you just base it solely on revenue numbers. So we’re very fortunate we work with the best of the best. But going back to that three, the achiever, that if they got to bust through a brick wall, they’ll probably go straight through it if they have to. So can you speak to, what I would call in our industry something that happens a lot is people work 50, 60, 70 hours and we’re not coaching them to do that. It’s just part of what naturally makes of successful financial advisor; they have to drive to help people to achieve. Can you speak to maybe when people tend to go to that unhealthy area, some ways to get back to healthy? And I know we’re dealing with probably with different numbers but let’s just assume those are threes, sevens and eight which typically salespeople that are gonna be in our industry. [00:39:35] Ian: Yes, they all have workaholic tendencies. Threes, because they have a need to succeed and they have a need to be admired, that’s a very important need. You ask a three to be honest and you ask them, “Would you rather be liked or be admired?” They’ll say they’d rather be admired. Whereas a two for example or a six or nine or a seven, would much rather be liked. But threes in particular have a deep need for admiration. What do you say happen to threes, unfortunately, often takes a big fall or a big crash before they come to this realization, is that their value in human beings lies in who they are inside, it’s not on their achievement. The problem is in our country, we live in a three country, so for a three living in our country, it’s like a drunk living over the saloon. It’s pretty tough to give up. I think there’s a… if I can use the word in a very generic sense, a spiritual journey for threes which is the realization that they are loved for who they are not for what they did. If they don’t figure that out, they will crash and burn eventually or multiple times in small ways throughout the course in their life. And it really damages their marriages, in a big way. It’s very difficult for a three to turn it off between the driveway and the front door. They gotta start the moment they leave the office to decompress. Threes have to learn to stop multitasking all the time. They can’t be listening to the news productivity podcast and closing a deal on their cellphone, texting on their iPad, driving a car, eating a sandwich and talking with their wife about a problem one of kid is having all at the same time and expect that the most important thing in their life, which is their family is gonna appreciate the fact that their ambition seems to take precedence over their relationships. Threes had a great deal of trouble with feelings. Number one, feelings tend to slow down progress. They’re messy. They require to deal and address them. So threes are experts in disconnecting from their feelings in service to accomplishing some task that they’re in the middle of. Problem is that after a while, they can’t stay disconnected from feelings their own and of others all the time. They also, by the way in the office, can run people over because they don’t recognize other people’s feelings very well. So I would warn anybody who works for a three not to not support some new effort or launch that a three is doing. You don’t want to not support that in public otherwise you’re gonna be sidelined. It’s not a good idea. In terms of the workaholism, its very hard. They just need to learn how to be in the world. Not just do. They’re just addicted to doing all the time. These are the numbers really take some disciplines to help unwind the excesses that can be found in each of them. [00:42:21] Brad: What about sevens or eight with that same question? Just going back to a lot of, I guess there’s a lot of listeners to this podcast are threes, sevens and eights. Does that differ at all? [00:42:33] Ian: No, it’s the same with different reasons. A seven will overwork because they want to avoid unpleasant feelings. Anything that will distract them from unpleasant feelings is their friend. They do a picture of reframing because that’s oftentimes just a way of being psychologically invasive of what’s happening in the moment. And for sevens, it’s very difficult to slow down. The difference is, they’re not as fixated on the work as the feeder in which they are going to prove themselves necessarily. They just love new adventures in any area of life. So the other night I was in California. I was with a guy who is a billionaire from China, it was a dinner and I’ve never met a seven like this in my entire life. I was like, “Oh my gosh, I’m in a room with a poster child of all sevens. This is the most amazing thing I’ve ever…” He can’t stop talking about new wines, new trips, new vacations, the new motorcycles, the new this. Just everything was about the new, the new escapade. And he never stopped smiling the whole night, it was stunning. Now interestingly, at the table, he knew what I did for a living and he was an intellectual like most sevens, very curious, really curious. So we had an audience, about eight of us around the table and we got talking about the Enneagram and he said “I’m not afraid of my feelings at work.” “Well, I’ll tell you what, if I took you to an island right now with nothing on it except you and me” I said “in about two or three days, you would start to feel a backlog of all kinds of feelings, anxieties and fears that you have been out of touch with. If I just took away all the wine and all the motorcycles and the houses and the bars and the jets, trust me you’d become just like the rest of us. You would have to start getting in touch with stuff that you didn’t even know was there because you’ve been moving so fast for so long.” If you’re an eight, eights can learn. But they’re bulldozers not diplomats. They have to learn that they are so intense. They carry so much energy that it’s intimidating and overwhelming to the vast majority of people. They actually exude a lot of anger, it radiates them often. It’s right beneath the surface, you can just feel it. When they’re unhealthy they have a sort of menacing feeling about them actually being unhealthy. I once heard of someone say, they were talking about Frank Sinatra and they said, he was a little guy too. This has nothing to do with physical stature. They said, “You could feel Frank Sinatra walk into a room 15 minutes before he got there.” That’s how much energy he had. It was this sort of intensity. When eights can begin to learn that again, like ones, their way isn’t the only way, that other people need to be attended to, that they’re have to be part of the team before they can lead a team, that they need to take into account the sensibilities of other human beings. Here’s the thing about eights by the way, unlike threes and sevens sometimes, ones not so much… Eights when they let loose at a party or they’re just having fun, they bring all the same energy and intensity that they do to work. These are the one’s on intense vacations and they are wonderful and very powerful leaders. But we all struggle with work in different ways. Threes, sevens, and eights tend to be such hard drivers that they get themselves in trouble. [00:46:04] Ian: Is this the money round? [00:46:05] Brad: This is it, man. This is the one. I think you’re good. Alright, so let’s go with the first one. When you hear the word successful, who’s the first person you think of and why? [00:46:18] Ian: Yo-yo Ma, the cellist is the very first person… if you ever met him, he is the most disciplined, optimistic but not foolishly optimistic, not Peter Pan optimistic. He, I think, really believes in the basic goodness of all people and believes in the best about the world but he’s not naïve. I think he’s a remarkable human being. If I get off this by the way in a minute and I’ll pick up ten others than I think are more but he’s the first place that came to mind. [00:46:59] Ian: I bet it was The Goat Rodeo. Done here in Nashville. [00:47:02] Brad: It was obviously cello but I don’t know which one. [00:47:05] Ian: He is probably the finest cellist alive. [00:47:08] Brad: Well now you know Yo-yo Ma, so you just went way up in my book, man. Not that you weren’t already up there before. [00:47:16] Ian: I’m a four. I know about the artist. [00:47:19] Brad: What’s your favorite book you’ve ever read and why? [00:47:24] Ian: Maybe Wendell Berry’s Jayber Crow, just a genius American novelist, essayist and poet from Kentucky. He paints portraits of human beings in the most remarkable way. I’d add The Brother’s Karamazov, Dostoyevsky. The Russians are like nobody else. Dostoyevsky can get inside the thoughts of a human being and just reveal the thought patterns of people that are just spookily accurate and beautifully written. The recent books that I’ve enjoyed by the way, Mindsight. I’ve read business books, I’ve read books about neurobiology and neuropsychiatry. Mindsight’s a fascinating book. I really recommend it for people who are actually doing work around the Enneagram. It’s a great compliment. [00:48:03] Brad: This is Mindsight. Different from Mindset, Carol Dweck. [00:48:11] Brad: Okay, we’ll have that in the show notes. Do you have a book you’ve gifted a lot over the years? [00:48:16] Ian: Yeah, mine! Gifted over years? Christmas, I always give away copies of a book by Oscar Hijuelos called Mr. Ive’s Christmas. Beautiful story about forgiveness, a shorter novel about forgiveness. So that’s one, I’m thinking of other books that I kind of give away. Obviously, Jayber Crow, the one that I just mentioned. I love Churchill, I give away the Biography of Churchill as often as I can. Just a tremendously fascinating leader. Yeah, that’s enough for now. [00:48:48] Brad: Okay, cool. This will be an interesting one with your background in psychology? Let’s just go back to the time of your life when you think you needed the most advice, so whether that was your 20-year-old self, 30-year-old self, 40-year-old self, can you just maybe speak to that time of your life, how old you were, where you’re at and the advice you would go back and give yourself now. [00:49:10] Ian: Yikes. Okay. I would say that one of my greatest regrets; I try not to have regrets but if I’m struck by one is this, I didn’t have a great mentor when I was a young man. My father is otherwise occupied with his own problems and I really found myself swimming around in lot of confusion about who I was, what I was called to do and to be. I once read a quote from someone, a novelist, I don’t remember now but I remember reading it being so struck. He said, “A young man who doesn’t have an older man who admires him is impoverished.” And I thought that is a remarkable statement. And it was just true. The young man needs an older man who admires him and admires his gifts and wants to help him find his way in the world. So I would actually encourage anyone in your audience, let’s say over the age of 35 or 40, that you have a younger person in your life that they recognize and connect to naturally, that they can help find their way in the world. It’s a great service to younger people who may have that. And to your women in the audience, to find younger woman who has the gifts and abilities or particularly I would say your women in the audience, that women need guidance in the workplace simply because the workplace to this day remains a difficult place for women of talent. For example, can I just make a really quick tangent? [00:50:34] Brad: Yeah go for it. [00:50:35] Ian: There’s no harder thing in the world for anyone in the business than to be a woman who’s an eight. If you’re a hard-driving, accomplished, get-it-done, bulldozer, tell the truth at all costs, and you’re a guy, guess what? You’re a hero. And if you’re a woman, you know what they’re called. It’s not good and it’s a terrible disservice and it’s really drained us or taken away lots of women who have tremendous gifts from exercising women in business settings. Guys need to be a little bit more self-confidence to allow these women to do their jobs in the way that they’re designed to do them. Let’s go back to the question again. Never had gone off on that tangent. What was the question again? [00:51:21] Ian: Yeah, get a mentor. Find a mentor or they use to say in the financial service industry in New York, find your rabbi inside that can help you find your way in the world particularly inside the setting of your business. [00:51:34] Brad: And I don’t think you ever outgrow the need for that really. [00:51:36] Ian: But you’re so open to formation at that point in your life. You’re looking in your rearview mirror and there’s just not a lot of wreckage yet usually. There’s not a lot of problems to look back on and it’s a magical moment. [00:51:50] Brad: Awesome. I love that advice. Alright, last question. You’re a pro, man. What is the one piece of advice you can share with the listeners that has led to your success? [00:52:06] Ian: Honestly I would say, develop knowledge across a broad array of disciplines. Specialization is okay, it’s good to have a deep well of information about a particular area. But learn widely. Read a lot and then read more. Read every genre. I have a friend of mine who is a very successful guy who owned probably 50 or 60 television stations and one of the bigger markets in the country and he got about 65 or 67 and I happen to notice one day that was carrying a list of 100 books. And he said, “My aim is to read all 100 of these books before I die.” And I said, “Wow.” And he said, “Yeah, I spent all of my life reading basically around business and maybe history books but I had no idea how much I could learn from other disciplines, other areas that I could have applied in the world of business.” So for example, if you read a book about Yo-yo Ma, you might think what does that guy do with business? Well if you’ve got an imagination and you’re a good leader, you’ll be able to find principles inside of what he does and what he knows that can be applied in your context. If you read Cicero or Marcus Aurelius, you’re gonna similarly find lots of information in there that is applicable in your marriage, in your friendships, in the organizations that you serve. So when you can begin to find universal patterns and ideas that overlap, you know you’re onto something that you need to know about. Often I meet young millennials, who come out of programs, anthologies where they’re highly specialized. And between that and Facebook, or Instagram and other social media platforms, you don’t actually have to interact with somebody face to face very much. You’re going to dinner with these folks a day you don’t know what to talk about. They’ll just look at you and I can talk about the software I designed to do X or about financial, I could do that but I really don’t know anything else because I’ve specialized the last four years in college and I’ve been in business for the last three years doing the same thing. I just don’t have anything else to say. And I think that’s terribly sad. [00:54:10] Brad: There was a study, I won’t remember, maybe we’ll throw it in the show notes but it even talked about engineers very technical discipline and it showed job advancement in the engineer sector and it all came down with best person to person skills. They’re able to interact with others, not so much the technical discipline of the job. [00:54:25] Ian: I’m just telling you. I’m not sure, but between self-awareness is what will create the natural climate or soil from which will grow good interpersonal relationships where the best that you’re capable of having. So if you don’t have the skill to understand, get along and empathize with other people, to be able to see the world through their eyes or get into their shoes, you’re destined for other shallow relationships, relationships that don’t function optimally in the workplace. And you’re kind of destined for loneliness in a degree of shallowness that nobody wants to live with. I would rather have a guy around the shop that had good people skills, good soft skills than to somebody who I had to spend a ton of time but wasn’t so good in that department nor did their job or were confident within their job and that’s why they’re kept around. I don’t see any reasons why businesses can’t have both most of the time. [00:55:29] Brad: Well, Ian this has been awesome. I’m so thankful that you’re able to carve out some time for my audience here today. It’s been enlightening as I knew it would be. Thanks for sharing the story of the Enneagram and as far as the show notes, we’ll make sure to get the assessment where everybody can go out and figure out what their number is. That’s an awesome journey to start and then obviously go pick up your book, The Road Back to You, as well if they wanna dig in and dive deeper in the Enneagram. [00:55:59] Ian: Absolutely. That’d be great. [00:56:01] Brad: Alright, Ian. Thank you. [00:56:02] Ian: Take care, friend.